Our classroom has been working on a wonderful project connected to the United Nations called Montessori Model United Nations. This being our first year in creation, students’ projects have been somewhat simplified and very focused. I have made the computers and books in my classroom available as much as possible for students to perform the necessary research. We now have run into a difficulty and need your help. Due to a variety of reasons, the server at MMA (and thus the internet permissions) is being heavily refiltered to ensure the greater safety of our students’ internet access. As we go through the transition, students do not currently have the ability to freely use the internet to continue their research. Therefore, we are asking that you would allow and assist your student in completing the research and writing their position paper. The paper should be a titled, double-spaced, bulleted notes page on the topic chosen. What is the definition of the topic? Where does the topic take place? Who is involved? How many people does it affect? Where, and in what ways? Why is this topic important? How has this topic impacted your country? What has your country tried to do about this topic? What types of policies would your country want the UN to adopt (or not adopt) on this topic? What specific plans would your country like the UN to undertake to address this issue? What specific plans would your country like Members States to undertake in their own countries? Why would your ideas work? Give specific plans. Thank you for bearing with me as I was out of the classroom last week taking a couple of sick days. I am feeling much better and ready to get back into the classroom. This week we have our RISE Science test for all three grades. Please help your child prepare by making sure they get plenty of sleep the night before and a good breakfast before coming to school. I will allow students to bring gum, snacks, and water with them into the test. Please remind your child that their gum will need to be thrown away at the end of the test. I will be gone again Thursday/Friday to finish my final observations for my training. I will be available via email if you have any questions or concerns. Greetings all! I hope everyone’s break was restful and restorative. Please be aware that this will be a long post due to the end of the year being upon us, but it is full of important information pertaining to the next two months, so please read it carefully. “UT state standardized assessments (now called RISE and Aspire Plus) will be on the following days for our class. These assessments are important to us for several reasons. The state assessment data are important to your family because the results are one way to communicate how much your child has learned in English language arts, writing, math, and science. At MMA, we know that these tests are but one indicator of a child’s progress in these content areas. The state assessment data are important to us because determining what a student knows or does not know is a vital cornerstone in individualizing learning experiences, which is the basis of a Montessori education. The results help us to identify needs for new and additional materials, tailor professional development for teachers, and determine where to best invest school funding. Taking tests is a practical life skill, required for college entrance as well many professions. Doctors, lawyers, teachers, contractors, nurses, and cosmetologists (to name just a few) all must take tests in order to enter their professions. Standardized testing in school provides a valuable opportunity to practice taking tests in a low-stakes environment, better preparing our students for future assessments – which is why we encourage all students to participate. Remember that your child is still learning to take tests like these, and often feelings of anxiety and assumed inadequacy can come from testing. If your child is suffering from any testing anxiety, please let me know so that we can support your child through this together. April 15: Redwoods Meeting, 5:30 – 6:30 PM. All 6th graders and their parents need to attend this meeting as we will be going over final preparations and telling students which cabins they are in. April 22: Early Release. We were going to have a field trip this day, but plans have changed. I will get in touch as soon as the replacement field trip has been scheduled. May 5-10: 6th graders on Redwoods Field Trip. I will be attending this field trip with the 6th graders, school for 4th and 5th will be as usual. May 24: Early Release, LAST DAY OF SCHOOL. From now to the end of the year, students will be working on a Montessori Model UN project. This is a group project. They have chosen a country to research and will spend the next week gathering information on their country. After spring break, they will be working on a position paper in preparation of the Model UN conference that will happen closer to the end of the school year. Because this is a group project, I will be offering time in class to work on this project. Students are welcome to take their packet home and do the research for their country at home. Students were sent home with their packets and country assignments today, but they have not had a chance yet to meet with their groups and plan out division of labor. The first part of this project is due Friday the 29th. I need them to research the answer to all questions found on the first page of their packet. As I said before, class time will be provided for students to work with their groups and divide this labor. Each student will then create a document that contains the answers to ALL questions found in the front of their MUN packet. I am not requesting that students use full sentences or proper grammar here. This document is for their own benefit – so note format (bullet points, incomplete sentences, etc.) is fine AS LONG AS THE CHILD CAN UNDERSTAND IT. I am aware that the first deadline is only a week away – as complete sentences, etc. are not necessary and the child will be provided in class time and support to complete this assignment, I believe it is possible for the entire class to be successful. It is ESSENTIAL to the process for this research to be completed. Please check in with your child daily in the coming week to make sure that progress is being made. Please be aware as you look through the packet with your child that Model UN is for students between 4th and 12th grade. The packet is written closer to a 10th grade level than a 4th grade level. We will be going through the packet in depth together, but your help will be vital for the student to be successful as we work our way through this project. Thank you for your support as your child undertakes this final project. It will challenge them in ways they haven’t been challenged yet this year, and it might be a painful growth process for some, but I know my class will rise beautifully to the challenge. If you have any questions, please let me know. Looking forward to getting back into the week. We will be leaving from North Shore at 8:30 to head to Lantern House. While there, we will drop off our hats and scarves and take a tour of the facility before heading back to school at 11:30. Thank you all for what you do to support our class! Tomorrow night is Literacy Night! Come in and join us! Dress up as your favorite book character and enjoy the evening! All week we will be doing book swaps. Students can bring in gently used books that they are no longer interested in and swap them for a new book! To encourage literacy at home and at school, students are encouraged to put the titles of books they have finished onto leaves and hang them in the hallway. Friday will be our school wide read-a-thon. Administration has asked for no pillows, blankets or stuffed animals to be brought in. 3/14: Pi Day! We will be working on Pi Based Activities all week – great talking point with your child! Please provide a nutritional lunch including juice or milk. Soda, caffeinated beverages, and candy are not permitted. Fast food is not to be brought to the school as a lunch substitute. We encourage all students at our school to help reduce waste by bringing lunch in reusable containers. Please help us learn to keep our environment clean and healthy. Student lunches cannot be refrigerated at school, so please include an ice pack if the lunch is perishable. There are microwave ovens available for warming, but food should be already cooked and require less than two minutes heat time. In the case of a forgotten lunch, students will be allowed to call parents twice. After that, in interest of encouraging responsibility and independence, natural consequences will apply. CLASSROOM RULES: please do not send your child with popcorn or red drinks/water additives like red KoolAide. These make an enormous mess and stain our carpet. Please make sure your child is being sent with some sort of protein in addition to carbohydrates and sugar. A lack of protein at lunch often leads to the student crashing before the end of school which leads to behavioral issues and melt downs. • Color: Any solid color. • Styles: Uniform polo’s, button–­down shirts (must remain buttoned even with undershirt). collar. For school safety teacher may require all students to wear school shirt on field trips. • Dresses: Must have collars. sayings, artwork, music groups, etc. • Material: Cotton, twill, corduroy. • Style: Plain, pleated, cargo; no sagging or baggy pants. extended down sides of body. Leggings must be worn with skirts/dresses. • Tights/hose/leggings: Solid colors only; leggings may only be worn under skirts/dresses/skorts. • Denim and or jeans may be worn on Friday only. *Note: a small pattern is acceptable. • Hairstyles and hair accessories are expected to be non–­distracting and out of their eyes. • Jewelry and other accessories are limited to wristwatches and non–­distracting earrings. • Hats or hoods will be worn outdoors only, and in the manner for which it was designed for. • Large or clanging jewelry. • Bandanas, feathers, or scarves. • Bare midriffs when raising arms or when sitting. • Clothing that is frayed, has holes, tears, stains or is made of denim. I will make a post with the March Calendar in the coming days. Thank you! I apologize for not being more on top of this, but each class is responsible for gathering items for the Gala Baskets. Our class theme is Camping Fun. We’re asking that donations be in by March 4th if possible but no later than March 7th. These baskets will be auctioned off at the Gala March 23rd. Here are some ideas for donations. Welcome to Spelling Bee week! Last week, your student was given the spelling bee test in class and we have selected our three students that will be going to the school spelling bee: Congratulations to Angel, Kamryn, Romeo and our alternate Jenny! The spelling bee will take place from 11 – 12 AM Tuesday, February 26th in the MMA Addition Gym. Parents are welcome to attend! Friday, our 6th graders have their STARbase graduation ceremony. It is from 9 – 1o am in the small gym. Parents are welcome and encouraged to attend. Hope we see you there! Literacy Week is coming up! 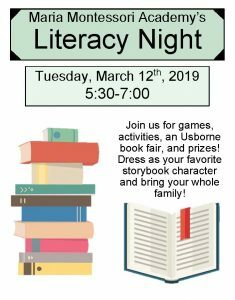 Please put Literacy Night on your calendar: it is scheduled for March 12 from 5:30-7:30 pm. We hope to see you there! Please be aware that I will be out of the classroom Thursday and Friday as I will be attending a class for my certification. Thank you for understanding. I will have access to email both days, so please feel free to reach out to me through email if you have any questions or concerns.